Bicycling is a fast, efficient, and healthy mobility option, which also reduces a neighborhood’s air pollution and traffic congestion. Have fun, get fit, start out your day energized, and do your part for the environment – what a deal! Eugene/Springfield is a Gold level bike-friendly community – we’ve got bike lanes, bike boulevards, and a great off-street trail network. Pick up a bike map at any of the bike shops all over town or from our office (99 E. Broadway, Suite 400) and plan your route. Eugene side Opens a New Window. [Eugene side-Spanish] Opens a New Window. Eugene side-Spanish Opens a New Window. [Springfield side] Opens a New Window. Springfield side Opens a New Window. [Springfield side-Spanish] Opens a New Window. Springfield side-Spanish Opens a New Window. You may also want to try Google Maps. Just type in your destination and click the bike symbol. Maybe it’s too cold in the morning, but the afternoon promises to be perfect for a bike ride. Or the ride to work is an easy downhill glide, while the trip home is an uphill climb. Either way, you can look to the bus to help you out. Each LTD Bus is equipped with racks to carry 3 bikes, no extra charge. For more information, call the City of Eugene Bicycle & Pedestrian office at 541-682-5471. Request a safe place for your bike at work. Ask your employer about starting an employee benefits program that rewards employees for bicycling to work. (Federal Bike Credit). Check with your employer about facilities for showering at or near work. Wear reflective clothing and use lights at night. In Oregon, bikes are vehicles and have rights and responsibilities Opens a New Window. according to the law. Also, check out The Bicyclist's Survival Guide for more safety tips! 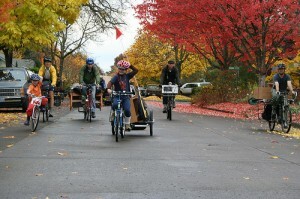 The Greater Eugene Area Riders, GEARs, offers Confident Cycling classes all season at a very low cost. These classes teach bicyclists the laws, skills, and technique to give riders the confidence they need to ride safely and legally in traffic and on the trails. The course covers state laws as they pertain to bike riders, bicycle safety checks, fixing a flat, on-bike skills, and crash avoidance techniques. A student manual is included. Recommended for adults and children above age fourteen, this fast-paced, nine-hour course prepares bicyclists for a full understanding of vehicular cycling and is a great resource for bicyclists at every experience level. Eugene Bicycle Map and Resource Guide Opens a New Window. Mapa de Recursos Andar en Bicicleta de Eugene Opens a New Window. Springfield Bicycle Map and Resource Guide Opens a New Window. Mapa de Recursos al Andar en Bicicleta de Springfield Opens a New Window. Manual del Ciclista del estado de Oregon Opens a New Window. Lock Your Bike Bookmark Opens a New Window. Eugene By Cycle Ride Guide Opens a New Window. Eugene By Cycle Ride Guide – Tips and Rules of the Road Opens a New Window. LTD Bikes on Buses Guide Opens a New Window.